In this blog, Dr Ruth Parkes, Senior Lecturer in Classics, discusses some contemporary issues that were raised during an in-class activity on Roman History and Literature last semester. Voices were raised and passions ran high during one of my lectures last December. Yet again, immigration was proving a controversial topic. Another Brexit conversation gone wrong? Mercifully not. In this instance, the political issues at stake related to Ancient Rome rather than the twenty-first century. Students were debating the ideas forwarded by Roman orator Cicero when defending the Greek teacher and poet Archias in 62BCE. Cicero (106BCE–43BCE) had took it upon himself to defend Archias (circa 120BCE–61BCE) against a charge that he had not gained Roman citizenship. If he had been found guilty, Archias would have been be expelled from Rome in accordance with the lex Papia of 64 BCE. Students had been introduced to Cicero’s ideas during lectures on the politics of the late Republic in my Level 4 module Roman History and Literature. As part of the module assessment, students acted out either the side of prosecution or defence based on the material in Cicero’s legal speech ‘On behalf of Archias’ (Pro Archia Poeta). Students really took to the task, and it proved a great way of introducing them to some of the hot political debates in Ancient Rome. 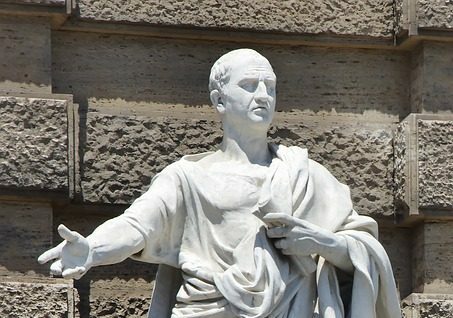 At the same time, when discussing Cicero’s ideas with students, some contemporary resonances became unavoidable. In successfully defending Archias, Cicero went to lengths to counter xenophobic prejudice being whipped up by the prosecution against the Eastern Greek poet and intellectual. Cicero stressed the value of Archias, as a Greek-speaking poet and as a deliverer of culture, for both the Roman state and for mankind. In the process, he argued that culture is the common bond which links humanity. This may just have been a rhetorical stance designed to win the legal case. Even so, Cicero’s speech contains some timeless sentiments. As such, Cicero’s defence of Archias need not only offer food-for-thought for first-year Ancient History students. Rather, his impassioned speech presents an articulate argument against fear of the ‘other’ that still has relevance amidst the current rise in nationalism and extremism worldwide.